This badge was issued to Faisal Iqbal on 16 Mar 2018. 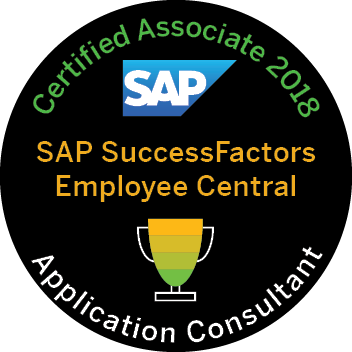 The certification exam verifies that the candidate possesses the basic knowledge in the area of the SAP SuccessFactors Employee Central application. This certificate proves that the candidate has a basic and overall understanding within this consultant profile of the industry solution, and can implement this knowledge practically in projects under guidance of an experienced consultant. SAP recommends that learners compile a personal learning plan using the Learning Journey, which contains all assets that are recommended to prepare for a certification. This includes courses in a classroom format or e-learnings available via an SAP Learning Hub subscription, SAP Live Access exercises and active collaboration in SAP Learning Rooms.